We're all for enhancing our TV-viewing experience, but this 6-pound helmet looks more like a prop from SpaceBalls than something we'd wanna wear. 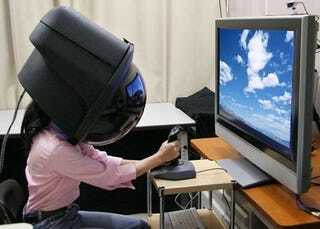 Still, Toshiba claims the helmet will give its wearer a 360-degree panorama when watching TV or playing games. Personally, we'd rather use it to scare small children.